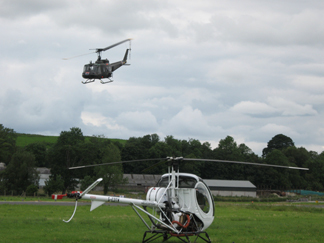 Huey was requested to attend the Newtownards and Enniskillen Air Shows over the weekend of 23/24 June 2007. The crew of 4 donned immersion suits, life jackets and stowed the dinghy for a 1 hour 10 minute flight across the Irish Sea . 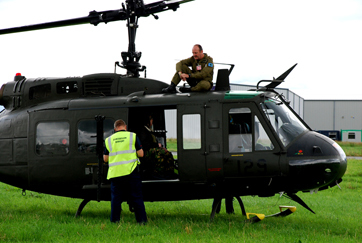 We arrived at Newtownards early Friday evening and were met with serious enthusiasm from the multitude of airport staff and flying club members as we were the FIRST Huey EVER to attend an Air Show in Northern Ireland . Next morning we fitted the 50 cals and prepared for the gate opening. 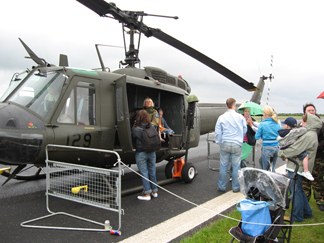 The interest in Huey was quite amazing and the queue for a closer look started to grow …and grow ….and grow! All in all, I reckon a couple of hundred people had a close look at ‘Miss Jo'. 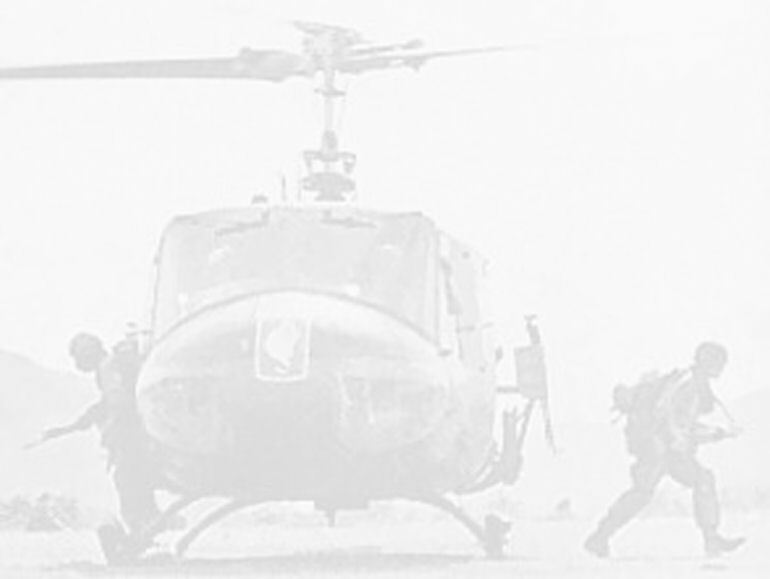 The Huey performed an 8 minute display routine within the airfield perimeter, which by all accounts, was well received and enjoyed. On completion of the flying display, ‘Huey 509' was once again opened to the public but for a limited time as we had to prepare for the onwards flight to Enniskillen later that evening. Once Newtownards Air Show had officially finished, it was time for all those aircraft destined to fly to Enniskillen to set off in a ‘mixed gaggle'. ‘Huey 509' has the same cruise speed as the Catalina with whom we flew with, ‘same way, same day'. Flight time to St Angelo was 50 minutes. The interest shown by the local populous as we arrived at Enniskillen was again, quite amazing. I was told the ‘thwok thwok' of the rotors could be heard for miles and enable folks to reach for their cameras in plenty of time. We arrived at St Angelo and shut down on the side apron next to the main apron and ‘socked and locked' her for the night. The weather had been kind throughout with only a few heavy showers to dodge en-route to Enniskillen. Next day saw a smaller but similarly enthusiastic crowd in attendance and we all enjoyed the splendid Air Show put on by Jeff and his wonderful team. The weather was intermittent during the Show leading to a flat display by the Reds. 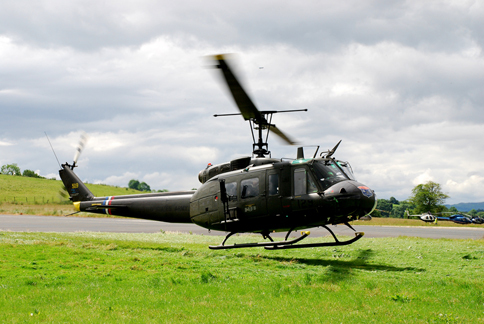 ‘Huey 509' once again flew an 8 minute display slot. 55 minutes flight from St Angelo to Newtownards for refuel followed by us all donning rubber suits and life jackets. One hour later we arrived back in Blackpool just in time to miss a huge shower and the worsening weather closing in behind us. In summary, a first class event with first class organisation and hospitality. 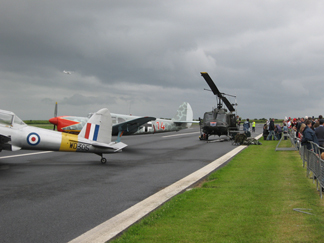 I recommend the Ulster Air Weekend to anyone.